This morning, the last day of my weekend before I return to work (I have one of those wonky compressed work week schedules), I arose early and was testing the functionality of the Internet from the patio room (so-called because it used to be our back patio, before this year's room addition), when I happened upon a (supposed) "news" story, titled "People really do still watch black and white televisions," which itself was a recast of a BBC story "Hundreds in Scotland still have black and white TV." Naturally, this story piqued my interest; I'm sophisticated enough to know that, on certain (supposed) "news" sites, stories are fed to you based on your past browsing history. For instance, when I log into Yahoo and browse their news story listings, all I get are stories about military equipment and aliens; unless I clear my cookies, first. Go figure. Which reminds me, did any of you receive any really good cookies for this Christmas? We received a great batch of biscochitos, a traditional dessert here in New Mexico that's like a sugar cookie but flavored with cinnamon and anise. Aaaanywaaaay, even though we tend to be "fed" (supposed) "news" stories from many sites based on our past history (and speaking of past history, why is it that when I buy - or, heck, even just peruse - some doodad from Amazon that they think I'd want to buy it again and again, over and over? ), in this case I don't think that "they" knew enough about my back history to glean any indication that I might be interested in this story about black and white television. Unless the Global A.I. is smarter than I think. I can justify owning these two artifacts from the mid-20th century based on several reasons. First, I used to be a TV repairman, was so for decades. In fact, the larger of the two sets (a 19" solid-state - meaning no vacuum tubes with the exception of the CRT itself - Zenith) I purchased for $10 from the shop I was working at, then fixed it by replacing a high-voltage ceramic disc capacitor (and maybe an electrolytic cap in the vertical circuit - it was having vertical "fold-over" issues, where the top of the picture folds down upon itself). 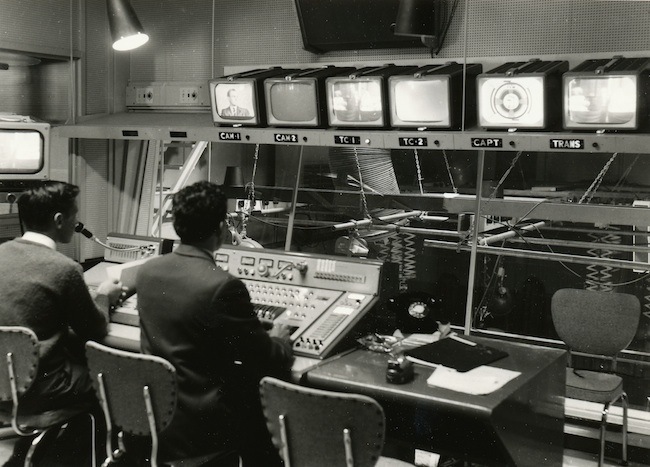 Second, I've always had a love affair with black and white photography, still maintain a black and white darkroom and thus watching broadcast TV in monochrome is a special experience for me, even today. Just like in still photography, where an image of some scene in black and white removes it one step further from reality while simultaneously revealing something of its hidden essence, there's an abstracting-while-revealing process that accompanies the watching of a contemporary broadcast in black and white. One loses the ultra-high fidelity of the HD color television signal, relying more on the content itself - which, in comparison to classic television programming from the mid-20th century, today is often lacking; as if there were some grand leveling effect at work, cancelling out the decades of advancement in slick hairspray journalism. Third, aside from my fondness for the black and white image itself, decades ago I dabbled in "art" videos by exploiting the then low cost of monochrome surveillance cameras, as a kind of surveillance art aesthetic. 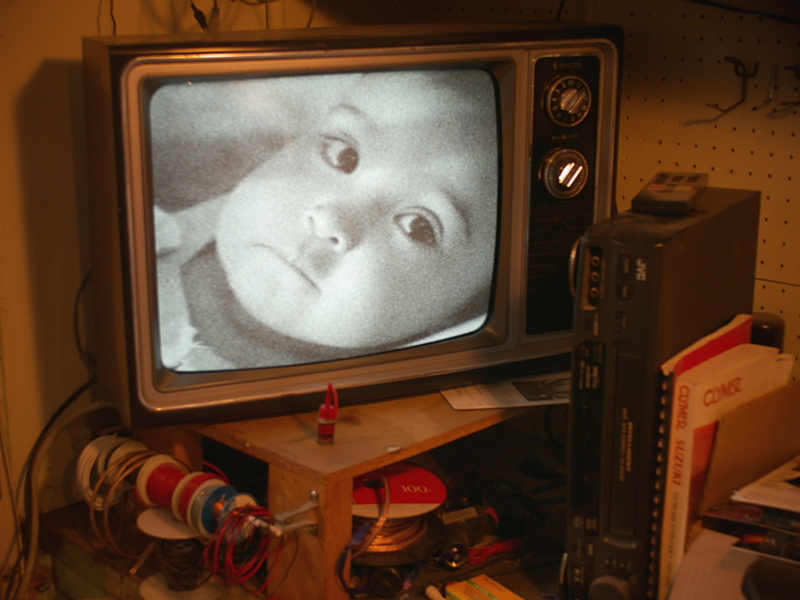 Watching a B & W CRT display still to this day reminds me of surveillance cameras, like the Telescreen of Orwell's "1984," or the steam punk aesthetic of the movie "Brazil." Fourth, while enlisted in the US Navy, back in the late 1970s, I was trained on television technology, and in particular had a fondness for those little rack-mounted monochrome CRT monitors, the kind ubiquitous to the television control room equipment cabinet of decades ago. The fifth reason why I might own several relics from the formative years of electronic media is that I'm a pack-rat, plain and simple; or, less severe, have a soft spot in my heart for discards, like some unwanted, abandoned pet. It is only because of the sanity-inspiring influence of my wife that we don't live in a dusty museum of obsolete arcana (though she might argue that last point). I mentioned that I have two black and white televisions. The second one is a small portable set that once graced the kitchen of my mother-in-law, which she kindly gave me, years ago. It currently resides in the Man Cave shed, upon which also sits the obligatory converter box (thanks to the generosity of the U.S. government - and tax payers - some years back, to ensure that none of its subjects are ever lacking access to the broadcast media, during the switch-over to digital broadcasting), which enables me to pull in the usual broadcast fare from the big 3-1/2 networks; but also a UHF station, channel 33 - Me TV - who show old classic American shows from the mid-20th century (like Andy Griffith and Happy Days); making it seem, while seated in the Man Cave, like some kind of time machine is at work - except that I don't suddenly get younger and more slender. Besides the obvious monochromatic appearance to the image, there's another aspect (literally) to black and white, which is its aspect ratio, the proportions of the screen's width to height, that being 4:3. It reminds me much more like viewing a black and white photograph, where the older, large formats (like 4" x 5" or 8" x 10") were more square in proportion to the newer 35mm film format of 3:2, or the contemporary TV standard of 16:9. It's interesting to me how these differences in aspect ratio play out in the way that scenes are composed. The angle of view of human vision I suspect is more like 4:3 than 16:9, more natural in appearance, but we've grown accustomed over the last few years to now expect wide-screen compositions, even if there's little of visual interest in the periphery of the scene. I find myself constantly thinking about aspect ratios while processing digital photographs. My two digital cameras each shoot a native 4:3 aspect ratio, yet for each individual image I try to crop it to what seems appropriate. Sometimes they stay 4:3, which places more importance upon vertical aspects of the image than the wider formats, especially where I'm fairly close to some human subject of interest. Other times, an image will get cropped to 3:2, a bit more landscape-like in appearance, especially good for wider urban settings where the horizontal expanse of the cityscape is more important than the sky above and curbside below. At times I'll even crop images to the more severe 16:9 ratio, but not often. I find doing so is more of an attempt at fixing a not-so-successful image, since I rarely compose in-camera with such wide formats in mind. Which gets to the subject of shooting video. Almost all consumer devices that shoot video now do so only in 16:9, which means that if you wish to make a full-body shot of a person, to fit their full height into the frame, you'll have to step a ways further back, or use a wider angle lens, than if shooting in 4:3. And you'll also have to deal with what's happening to the sides of the subject, because that wide angle of view pulls in distracting elements into your scene that you might not have desired. Having to step further back to fit your subject's height into the frame also means that if you're relying on the camera's onboard microphone to pick up their voice, it will be less distinct. 16:9 simultaneously shows us a wider landscape, while removing the camera person further from the subject. Not necessarily bad, but for certain a different experience. There remains several other elements of the black and white television experience worth mentioning. One is that the CRT screens were never actually rectangular, more like a super-ellipse, with slightly curved borders and rounded corners. This was an evolution from the early days of TV (in the pre-color days of the 1950s), where the devices' cathode ray tubes were actually round, but the TV cabinet's front bezel masked off the round screen to this somewhat-rectangular-but-still-rounded appearance that became such the norm that it seemed revolutionary at the time when Sony eventually came out with the Trinitron color screen, which was actually more like a cylindrical shape with square corners. This becomes much more noticeable once you've watched modern flat-screen sets and then return once again to an older CRT. The other quaint aspect to these old televisions is their "klunker" tuners, the round dials that you had to turn ("thunk-thunk-thunk") to change channels, with the round dial along the edge that you pressed in and turned to fine-tune the reception. These sets had two such dials, the top one being for VHF channels (2-13), with a "U" position that then enabled you to tune in the higher UHF channels (originally 14-88, but later 14-69) with a secondary dial that didn't go "thunk-thunk-thunk" as much as it went "clickety-clickety-clickety". Compared to modern televisions, having individual control knobs for adjusting various qualities of the picture seems very quaint. Both of my B & W sets have individual controls on the front for volume, brightness and contrast, but in the back are additional controls, most commonly a vertical hold knob that protrudes for "easy" access, with recessed controls (requiring a screw driver) for vertical height, horizontal hold and focus. The analogy would be like having a car with a manual choke knob and backup hand-cranked starter, with additional knobs for spark advancement and fuel pressure. Interestingly, there's a retro-style revival currently underway with digital cameras, especially from the likes of Fujifilm, who are now known for providing a plethora of mechanical knobs on their cameras, for the direct control of the various exposure functions. Photographers are also now more conscious of having an option for manually focusing their lenses when so desired, and often lament the focus-by-wire slowness intrinsic to modern electronic lenses. Unlike with photography, however, I don't think there's an actual revival of black and white television, as some hypothetical hipster fad; the BBC article, mentioned above, suggests that these remaining B & W sets in Scotland might simply be a matter of the way many people in rural settings hang onto things more often than in cities, not hindered by the limitations of space or the need to constantly relocate. Personally, I'd like to pretend that there was this monochrome TV revival fad, since that would imply that I'm, for once, on the forefront of cultural advancement; or perhaps I should revive my dormant Instagram account and begin posting hipster-like images of my quaint mid-20th century television receivers, in the way that camera fondlers love to post "glamour" shots of their shiny metal fetishes, all decked out in leather half-cases and sporting elegant straps. But honestly, there's little to be found elegant in crappy plastic-cased TV sets from decades ago, brown-tinged in old cigarette smoke, perhaps. One gets the sense that these appliances, cranked out of by the millions from factories now long gone, were never intended to be fetish objects or heirlooms, like Leica cameras, but just disposable consumer products, soon to be obsoleted and replaced by next year's New Model, ad infinitum. Which reminds me of the way cell phones are marketed today; the more things change, the more they stay the same. Post-Script: There's another story pertaining to the future site of the Pup-N-Taco worth telling, when it was being graded up and mounds of dirt were plentiful, which is that my brother and I discovered these dirt clods, that if hurled with sufficient force, would make wonderful splatter marks on the side of grandpa's house. One Sunday afternoon (obviously church that morning having little impact on our souls) we spent several hours in revelry with our dirt clods, but the fun was eventually spoiled by my dad, who was not amused; I suspect it had to do with the fact that as a teenager he and his dad had their problems; he even ran away from home to an uncle's farm for a year. So I think dad was hoping that his sons would make a better impression upon grandpa than did our dirt clods upon his house. It took several weeks for the strap marks to disappear from our behinds; spare the rod, spoil the child, and all that. I always felt that we earned what we got, and never had hard feelings toward my dad because of the punishment meted out. One thing's certain: we never did that again! In later years the drive-thru was renamed "Pop-N-Taco," probably due to an ownership change; there was eventually three locations, but they're all now gone. Recently the Special Collections Library was closed for a remodel. 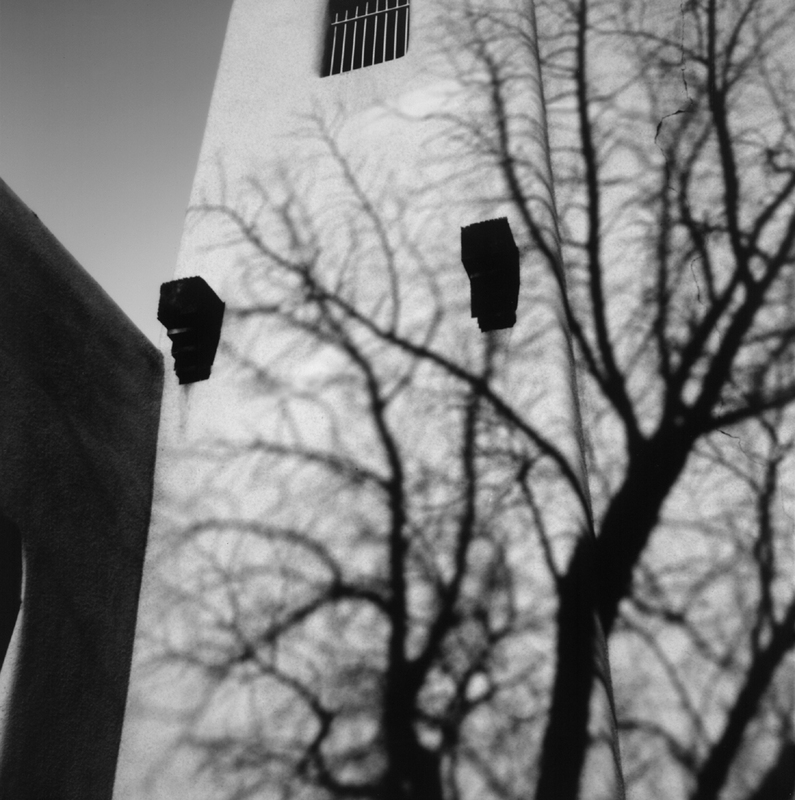 I'm going to have to place a visit again, and maybe with it make another pinhole picture. 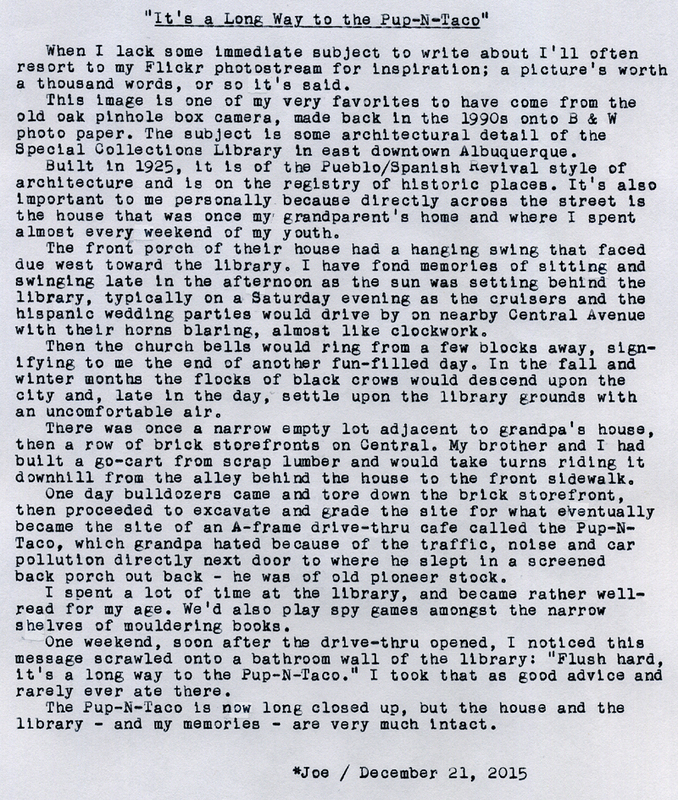 Grandma died in the late 1960s, and grandpa turned sick in the early '70s (family legend placing blame on the car exhaust from the Pup-N-Taco next door), whereby grandpa sold the house and moved out of town to spend his remaining years with his daughters. The house and entire neighborhood underwent the Federal Urban Renewal program, and was eventually remodeled and sold to a lawyer's agency, which it remains to this day. It had been in my family's ownership since 1903, when my great-grandparents came out west from Indiana in a covered wagon. Post-Script: Of course, we don't yet know if the camera is totally functional until I finish that roll of film and get it processed. But inspecting the camera before purchase indicated that the shutter and metering appeared to be nominal. Today, I took a field trip to downtown with my brother, where we placed a visit to The Man's Hat Shop (he being in the market for a hat, not I), during which time I carried the little Minox in its carrying case in my jacket pocket, and was enthused about how small and light it is to carry. And dang, was it cold today, post a snow storm and with blowing wind. In operation, the lens is operated scale-focus only, meaning you have to estimate at what distance you wish to be in sharpest focus and set the lens accordingly. Then, as you frame the scene, a needle on the right side of the viewfinder indicates the shutter speed based on the lens aperture you've set. Myself, operating these scale-focus cameras is no big deal, I've been doing so for years. Plus, this one has good depth-of-field markings on the lens, so in bright light it's easy to just set an intermediate aperture, preset the focus to the hyper-focal setting and click away. The meter doesn't activate until you advance the film, which is a nice feature that helps to preserve the battery life, since you can compose your scene in the viewfinder before hand. The shutter button itself is a bit sensitive, and makes a little snick that's barely audible even to the photographer. Once the clam-shell lens cover is closed up the camera is very small. Here's the link to Camera & Darkroom. 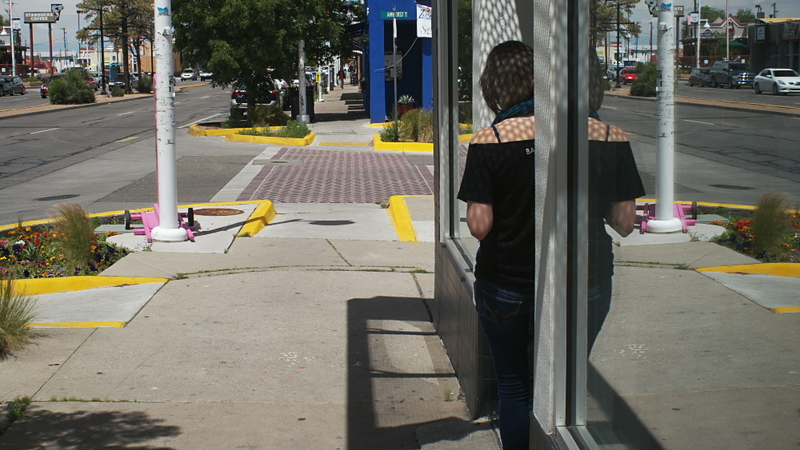 Be sure to stop by when you're in town, because now they're our only remaining camera store. Typecast via Smith-Corona Silent. 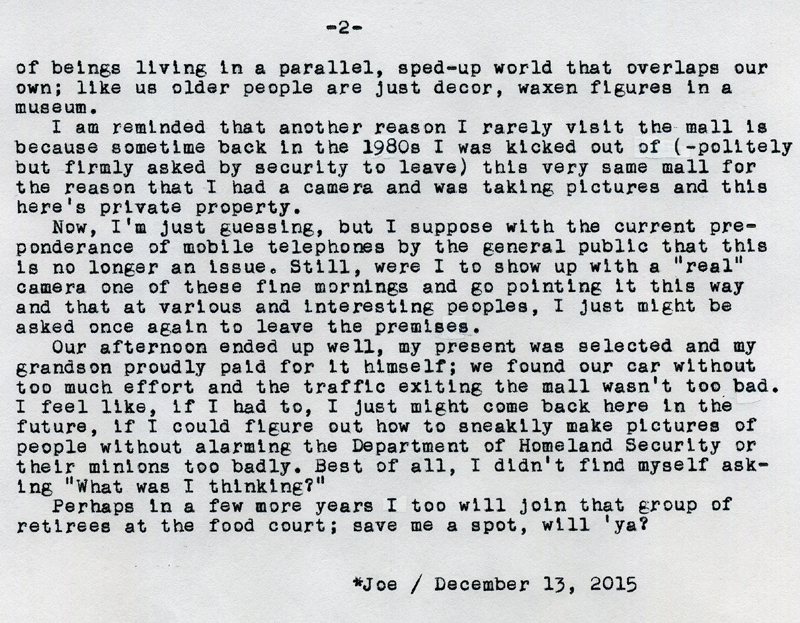 Post-Script: My dad, in his later years, also found the mall to be a convenient place to visit on a daily basis, where he could walk laps inside the complex without being exposed to summer's sun or winter's chill. I will also say this, the food court has a much better selection now than when I used to frequent such places, years ago. Yet, despite all the improvements, I'd be hard pressed to become a regular mall rat. Which, now that I've used that term, I did notice many more people lurking about under the stairwells who seemed to fit that description. Must be the economy. Regarding the photo above, it's not actually from the mall but about a mile down the street, Buffet's Candies, the owners of which are supposedly related to that Warren Buffet. So no mall photos (yet), but kind of Christmas related. 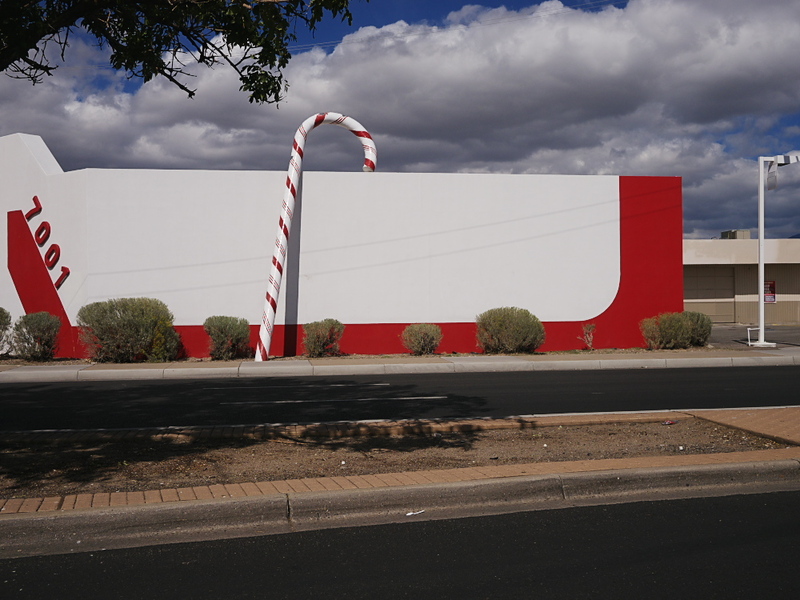 And yes, the candy cane sits leaning against their building year-round; go figure. Typecast via Smith-Corona Silent. This morning, before our mall trip and the inspiration for this story, I'd been sitting in the patio room looking at this machine, noticing that, even though I've owned it for over a year, I never have really cleaned it up. So I took it out to the (now cold) garage workshop and proceeded to apply toothbrush and Windex to the crinkle paint finish, removing many of the old white-out flecks and dust motes. Still, it remains but a mid-20th century drab office brown tone. Not that I'm going to go painting it some fancy colors, since the platen knobs are also brown. But at least it's a cleaner version of mid-20th century drab office brown tone. Post-Script: Of course, it helps if the old film camera is working properly. And it helps if you know how to use the camera as it was intended. In the case of this Zorki IV, I noticed today while shooting a roll of Ilford HP5 that at infinity focus the rangefinder images don't exactly line up as they should; perhaps an issue with the lens cam. But depth of focus should compensate for any focus errors, given that I was using a small aperture as necessitated by fast film and bright light. Unfortunately, that roll of Kodak Ektar 100 that I (supposedly) shot downtown this last Sunday ended up being blank, unexposed. I suspect the leader slipped off the take-up spindle after loading, and I must not have noticed the rewind knob wasn't turning when I'd advance the film. I knew something wasn't quite right while rewinding the film, as it didn't feel right, like there wasn't enough resistance while rewinding, nor did I sense the leader slipping off the take-up spool, where it should suddenly get easier to turn. I think the take-up spool in this camera doesn't clamp onto the film sprockets as it once did; but I also need to be more careful to ensure it winds on properly. Oh well; one roll of film wasted. I do have another rangefinder camera to use should this one prove too problematic, that being the Kodak Retina IIIC. And, of course, several film SLRs, too. Photo via Lumix G5 and the 20mm-f/1.7 lens, wide open. Typecast via Smith-Corona Silent. Post-Script: Lack of preparation meant the battery in my digital snap-shooter died before I could acquire Ms. Holm's visage, while the color film in the old Soviet-built rangefinder will have to wait for another few days before I can see the results. But all was not lost, as I hadn't picked up this film camera in a long while, and thus today's outing served as an opportune moment to reacquaint myself with its rather militaristic charm. Last night we viewed the DVD of "The Typewriter in the 21st Century," and I was most impressed with David McCullough's testimony of having used the same typewriter, for the last 50+ years, to write the bulk of his work. 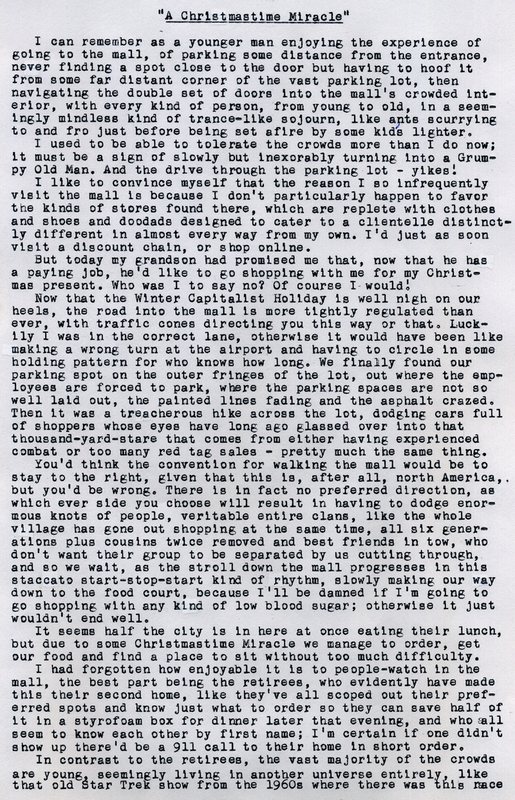 He was very adamant as to why, for him, the typewriter was so very important to his writing process, which is that the speed of thought as a writer is very much the main roadblock in the process, while the speed of recording words into some medium is nowhere nearly so, even with using manual typewriters. Another important point made was that at least half the writing process is revision, and doing so on paper results in a recording of those interim steps along the way toward a completed work; perhaps not so important for the legacy of one such as I, but for important writers such resources are invaluable to the scholar. I'd have more to say on the whole subject of writing methodologies, but I'll spare you for today. Early this morning I arose and banged out a lengthy scroll with my Smith-Corona Silent onto the Little Arse Roll of Paper, double-spaced, that ended up being over four feet in length. Being as how this 6" wide roll of 3M-brand white automotive masking paper is rather thin, I rolled up a sheet of printer paper around the platen, which served well as a backing paper. 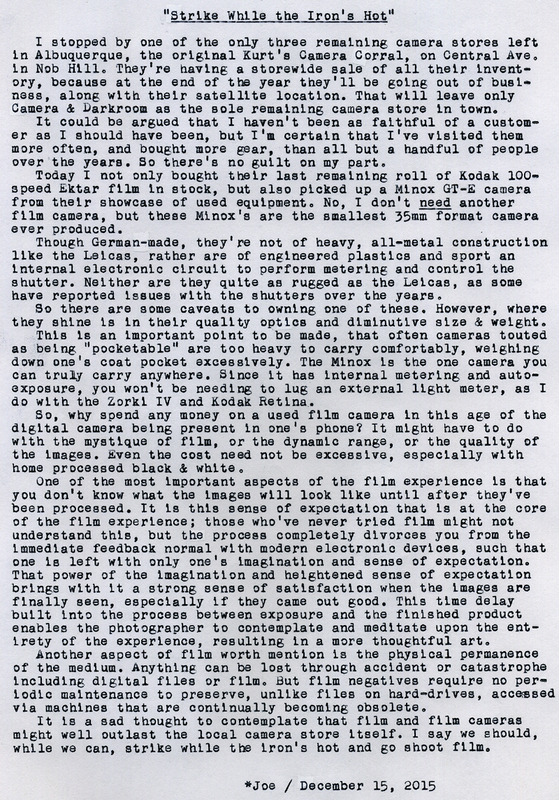 Here's the thread on Rangefinder Forum wherein I jump the shark with my writerly prowess. Photos via Fujifilm X10, typecast via Smith-Corona Silent. Post-Script: Rant, page one and page two. 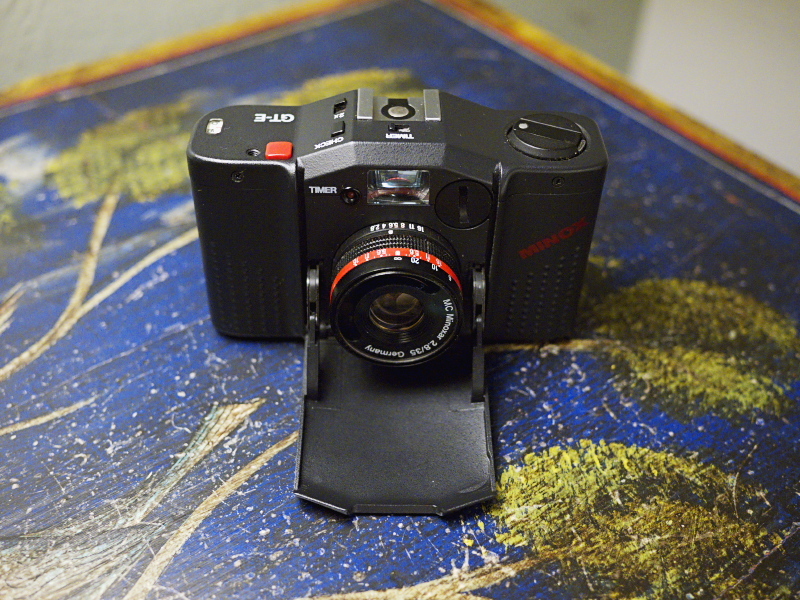 The detailed article about this camera, on my Obscure Camera blog, is here. Typecast via Smith-Corona Silent. I've cut out a piece of carpet pad and it makes for a very good typewriter pad, both stopping it from sliding on smooth surfaces and providing noticeable sound-deadening.